This article was originally published in the Fall 2012 issue of Hollerbeer Haven (big file, give it time), but, since Zahwehwatzel is currently blooming gleefully in my garden, I decided to share it here, too. This plant is not a traditional Deitsch herb, but it is used currently in our herbalism. Since the time that this article was published, I have begun adding Zahwehwatzel to various cold sore (Nachtbrandzetter) remedies, and the results seem to be rather pleasing to those who have tried it. The numbing effect of the spilanthes carries into the remedy and temporarily alleviates the pain of the cold sore. Every now and again we come across a plant to which the Doctrine of Signatures certainly might apply! Spilanthes is one such plant. Known in English as the "Toothache Plant," Spilanthes looks like an aching, inflamed tooth. This annual is tender to frosts and prefers full sun to partial shade. 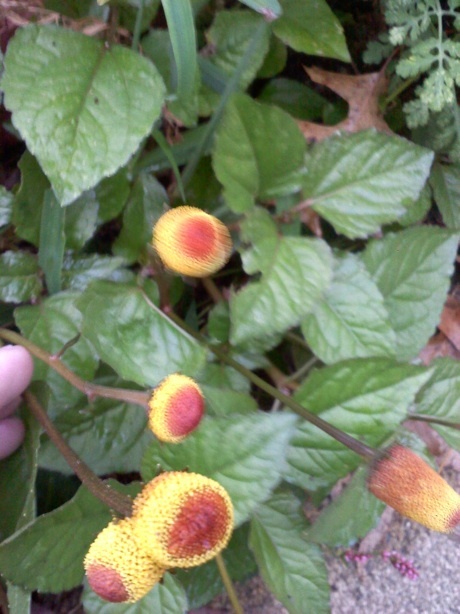 Spilanthes contains alkylamides similar to those of Echinacea species. It enhances resistance to infections and to colds and the flu. It stimulates wound healing and decreases allergic symptoms. It is indicated for swollen glands, gum disease, and acute bacterial, viral, and fungal infections. It is used to combat intestinal worms, ear infections, cold sores, and herpes.As its nickname implies, it serves as a local anesthetic for dental issues. I have mixed Spilanthes tincture (fresh, 1:2, 100% A) with tinctures of lemon balm, self-heal, and white hyssop and set into a lip balm for cold sores. We typically use it in a tincture, but we are now also infusing the wilted herb in oils (sunflower, grapeseed, and olive) for inclusion in cold sore balms and creams. The leaves and the flowers of this plant are considered to be a nutritious, spicy green addition to a salad. If the flowering head is chopped up, you may notice a small, somewhat pleasant tingling. If you bite into a large chunk of the flowering head, be prepared to go numb! 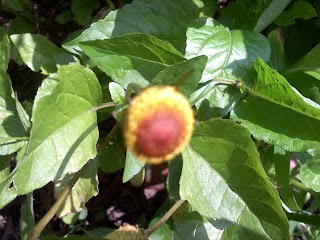 I had originally followed Tammy Hartung's advice years ago when I first planted Spilanthes. She said that Anise Hyssop (Agastache foeniculum) looked "festive" when planted next to Spilanthes. Understatement! Her advice also led me to plant near Stevia and Gotu Kola. All of the plants grew well, but the appearance of the final flowering of the Anise Hyssop with the emerging Spilanthes flowers in the mid-autumn made for a beautiful contrast of colors. In the 2013 garden, Spilanthes continues to grow nicely by the Gotu Kola. The Anise Hyssop has spread throughout the beds, but the Spilanthes also seem very happy thriving alongside (with some space to ensure sunlight) several of the Monardas (Monarda didyma, Monarda punctata, Monarda fistulosa). Last year there was an apparent shortage of live Spilanthes plants. My usual starter plant herb farms here in Eastern Pennsylvania did not have the plant, so I checked online and did not have any luck with my usual vendors. Fortunately, I had some old seed heads, and they easily reseeded and carried us through the summer. In the winter, I started a couple of seedlings in pots and grew them indoors under a grow light. They grew easily, and my cats each only tried chewing on the leaves once! The winter plants provided the seed for the plants that are now growing outside. Thus, let some of the later flowers go to seed and save the seed heads! This plant has a mischievous and cheery spirit. I would not call it a trickster per se, though. It's youthful energy can echo one's own youthful spirit and help to reinvigorate one's sullen spirit during times of adversity and stress. Van Wyk, Ben-Erik and Michael Wink. Medicinal plants of the world. Portland: Timber Press, 2004, p. 307. Hartung, Tammi. Growing 101 herbs that heal. Adams, MA: Storey, 2000, pp. 154, 221.